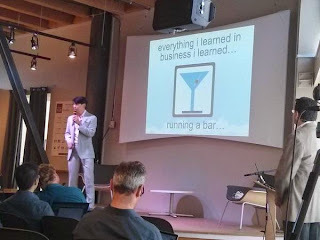 Jonathan Sposato, chairman of GeekWire, kicked off the Seattle Angel Conference with an enjoyable keynote entitled "Everything I learned in business I learned running a bar." How did a serial tech entrepreneur end up running a bar, you ask? Well, apparently he was looking to diversify his investments during the late 90's tech bubble and bought some distressed real estate in Seattle. When finding tenants proved difficult, he decided to become his own tenant. The experience taught him seven "bar rules" that encapsulate timeless business wisdom. Most of them are common refrains in the start-up space: design affects behavior, your team is critically important, and no job is too small. The one that stood out to me the most? "If you create a place for men, only men will show up. If you create a place for women, men and women will show up." Fantastic insight, especially from someone coming from tech. On that note, during the Q&A session Jonathan made the bold statement that he's not willing to invest in companies that do not have a female member of the founding team, eliciting whoops and cheers from the crowd. Two of the six finalists today specifically target women, and three were founded by women, so he’s certainly speaking to a partial audience. 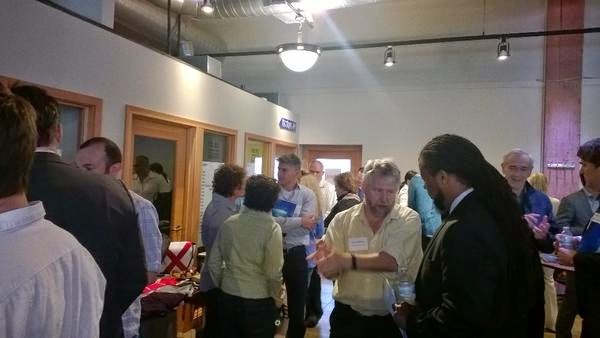 The first three companies to pitch were Yottio, Glamhive, and TomboyX. My biggest takeaway was that these are three very different start-ups. Yottio is a platform that will enable television and other live media to pull in real-time live streaming content from viewers. They already have $300,000 in revenue, and are aggressively projecting $200 million in two years. Glamhive, on the other hand, is a social media platform for women to connect the style photos they share with actual products, to enable others to purchase those styles. After hearing the keynote from Jonathan Sposato earlier, I was not surprised to learn that he is one of their principal advisors. And TomboyX is building a women's clothing brand that seeks to combine style with a level of fit and quality that is often only available on men's clothing. Their most impressive metric was a return rate of only 1%, where 20-35% is typical for women's clothing. I solicited a very small sample of opinions from my fellow attendees, and it seems that TomboyX did an excellent job of hooking the audience emotionally. One person said that she was brought to tears by their brand statement, and another mentioned that they are tapping into a massive unfilled need that has existed for a long, long time. The most common positive feedback I heard about the pitches was that they did a great job of crafting the story behind the product. There was very little criticism to be found, but one investor mentioned that he would have liked to see a more thorough exploration of traction and go-to-market strategy from all three teams. After the intermission we were introduced to another set of three start-ups, all of which are SaaS plays. First up was Attachedapps, which is attempting to serve small businesses' CRM needs by filling in the gap between "good enough" solutions like Excel, and enterprise products like Salesforce. I really liked how they opened up the presentation by talking about the intersecting trends of IT consumerization and the unbundling of software through apps. Next was Payboard, which combines AB testing, path optimization, and automation to turn website visitors into revenue. I thought this was the most polished pitch of the group, and I really liked the product, so they would probably get my vote if I was deliberating with the other angels. And, last but not least, was Sqoop. Sqoop has created a free web service for journalists to unearth company information and data from difficult to access sources, which they plan to monetize by connecting the PR industry to the captive audience of reporters on the service. This is probably the most non-intuitive business model of the group, so they had a very challenging pitch to make. After dust settled, I asked the entrepreneurs about the challenges they faced in putting together their pitches. The most common answer? Simplifying the message for the audience is really hard. This is especially true for high-tech start-ups that need to convey the essence of the product without getting too far into the technical weeds. The nature of audience itself also presents challenges, and one founder mentioned that he has over 70 versions of his pitch deck that he has tailored for different audiences. Another stated that reworking pitch decks for different audiences and formats could eat up 100% of his time if he allowed it to. All of the companies spent a tremendous amount of time refining their pitches, but how do you handle feedback on your pitch? One founder said that he had some fears about making changes to a presentation too close to the pitch. But as long as the feedback is from people who you trust and who understand your business, it will probably improve your pitch. Last-minute changes can be very effective. One case in point: another founder said that the icing on the cake for his pitch was including a story about how he explained the product to his five year-old daughter, which happened only a couple days before the conference. Finally, now that the pitching is done, is there anything that the entrepreneurs wish they could do over? Everyone mentioned at least one key line that they missed during the presentation, but one good way to recover is to try and work it into the Q&A session afterwards. Another point that everyone agreed on was the need to polish their storytelling, to really draw the audience into their domain at the beginning of the presentation. Jim Howes is an MBA student at the University of Washington Foster School of Business. He can be reached at jhowes@uw.edu.